Can't anyone handle a "Sorry! "...., or a "Beg of pardon"...., and a person's regret of writing something both here, in PM's and on FB...???? How sorry must I be??? How many times must I admit stepping in the salad???? Holy, I'm almost drowning in it for God's sake!! I've said I'm sorry to the person direct, I've said I'm sorry to all of you viewers...., what else can I do??? Any suggestions?????????? If I see two pictures looking like copies, I will always ask questions...., no matter who's behind the camera, even if it was our dear Captain. A short note about the tripod would have explained it all, and I wouldn't have written a single letter! and I also said Joakim was a great student. The pictures as such are great!!!!! Last edited by Sterkoder; November 28th, 2012, 17:26. Now now everyone. Why dont we all take a deeep breath and calm down now,please. I think we all must remember what actually is the reason why we are spending time here, and that is ofcourse because of our loved ship Nordstjernen. Are we perhaps so fired up about Her is leavin us that we are letting feelings take over? Nordstjernen is now outside Gothenburg at the seastretch Kattegat.She is doing over 13knots on her way to Gdansk,Poland! Nordstjernen is now outside Gothenburg at the seastretch Kattegat. She is doing over 13knots on her way to Gdansk, Poland! 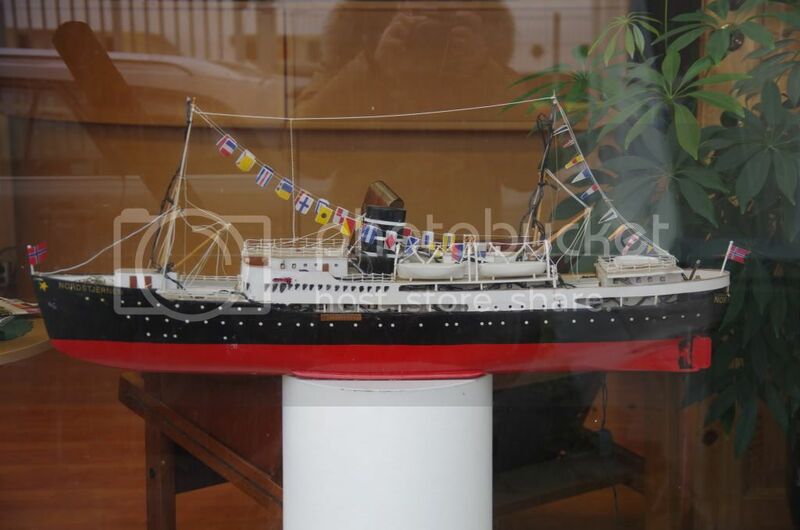 The model of Nordsjernen in Hurtigruten Terminal at Finnsness. Last edited by yvneac; March 19th, 2013, 16:38. Am I wrong, or do some of those ropes need tightening? But it can be done in Norway.It is not necessary to send her to Poland! Excellent!! I couldn't have hoped for better answer. Last edited by Sigve; November 29th, 2012, 17:50. I missed out on the great discussion here and, as a "non-FB" member, I also missed the pictures in question. Is it possible to post them back here on CVF??? As for NX heading for Poland for repairs?? It does make a lot of sense. It is less expensive to do the repairs and re-classification there then to import Polish workers to Norway to do the same. Seeing that R.S.Platou Finance is in the picture should indicate that the finances are in place to do what it takes to get her back in shape. A lot of work is needed if the intention is to keep her in class and certified for passenger traffic, even if it is only in Norwegian Coastal trade. Agree.... this is definitely the Nordstjernen of 1937. Miniatyrskip.no have started production of the Nordstjernen model... are there anyone here that have made an order for one? Yes, I have ordered one. I'm excited and can't wait to receive my "Nordstjernen"
Very nice photo light in the last picture. Great timing Bengt! A very nice photo: perfectly exposed because you can still see the details in the black hull (anchor) and the white superstructure is not "washed out"... Well done job!